And I haven’t done a single thing to those walls or windows since. They still look exactly like that, so I’m very anxious to get the drywall finished up and get the windows trimmed out and finished. But you can see that once the windows have the tall top header, and once the crown molding is wrapped around the walls (rather than just around the top of the overmantel) things are going to start to get a bit crowded, and I’m just concerned that there won’t really be enough room for drapery brackets and a drapery rod. Or I’m concerned that the rod might cover up the very top part of the window casings, which I think would look really odd. Now I’ve seen curtain rods installed about halfway down on top fancy casings, so that the very top molding on the casing shows over the curtain rod. Honestly, I’m not a fan of that method of installing draperies, and I really think that works best if you have tall ceilings. Since my ceilings are only eight feet tall, I need my draperies to go as high as they possibly can, or else they’ll make my walls seem even shorter than they are. So it seems that my only option is to do a different-but-coordinating casing around the windows. 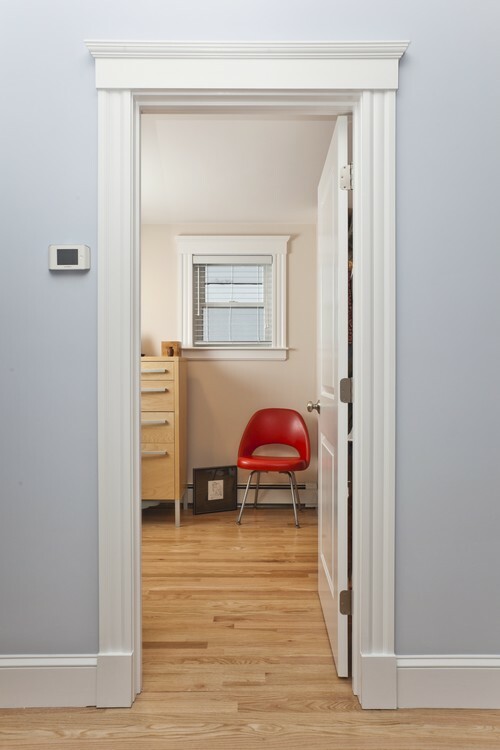 I’ve searched and searched on Houzz to see if this is something that’s ever done, and try as I might, I can’t find even one example of a room with different door casings and window casings. In room after room that I found that has both door casings and window casings, they all match exactly. And I can’t remember ever seeing a room in person that has different door casings and window casings. It’s not that I’m concerned about doing something different or non-standard in my house, but it’s just one of those things that I’d like to see an example of before I do it. When I picture it in my mind, I think it’ll look fine, but I’d love to see an example of where it was actually done in a room to confirm that it’ll look just fine when it’s finished and my draperies are installed. Coordinate but don’t match is the way to go. Only track homes have everything matchy matchy. Your rendering has them not matching. I agree with Deb. To much matching makes a space feel more formal. More formal and less creative. Sorry, but I don’t think that’s the case (no pun intended). Our house was built in 1939. Our previous house was built in 1923. They are anything but tract houses. All the casings match. Even in the 60-ish addition on our present house, they made an attempt to match the new casings with the old. It’s not a perfect match, but close. However, I don’t see anything wrong with a little variance as long as there is coordination. Chances are, most people won’t notice. My home was built in 1898 and the door and window casings match. That said, I don’t think they have to match but they should coordinate. By that I mean the door casing shouldn’t be simple and the windows elaborate and vice versa. My door and window casings match. And on recollection, I think they have in every house that I have ever lived in. Here’s a link to show you what I am talking about: http://www.jcpenney.com/studio-ceiling-mount-curtain-rod-set/prod.jump?ppId=1d64e8c. I googled “ceiling mounted curtain rods” and saw numerous examples. Why is it so difficult to reply to your comments. It tkes forever for the lettering to appear in the screen, vvery frustrating and not amenable to reply. Suggestions? I waited and waited to agree with you 200%. I have same issue and it’s frustrating! I have no trouble at all posting comments. As simple/plain as possible. There is so much going on everywhere else, and probably curtains vill hide it, after all. This looks great! Puts the emphasis on the doorway. I have had the same question!!! so thank you for posting this, since I too am doing a remodel and I am hoping to install crown molding and update door casings. I’m thinking of updating certain doors first. For example, my front door and side door (which is an entrance directly into the kitchen and is a prominent door opening like the front door). As well as an opening from the living room into the hallway leading into the bedrooms. But again, I won’t be doing every door way and no windows so will this be totally weird? We only plan to be in the house another 2 years so I know I will never get to the windows . . . I would do the same style but you can make the header narrower to fit better. The style should be consistent but the dimensions can vary to suit. I think mixing them would look odd. This was my suggestion as well– The style coordinated, the scale varied. My previous house had this variance throughout the main floor and it looked like it belonged that way. I think it was to economize wall space for treatments just as you are discussing. In addition, some of the door casings were prominent openings and the same scale would have looked weird on the windows. Another vote for the same style but at a smaller scale on the windows. I don’t think I’ve ever seen window trim that wasn’t similar to the door trim except in a few bad renovations where windows and/or doors were added later. But the windows and doors aren’t always at the same scale. That’s the best solution, IMHO. Have you considered building a cornice box? 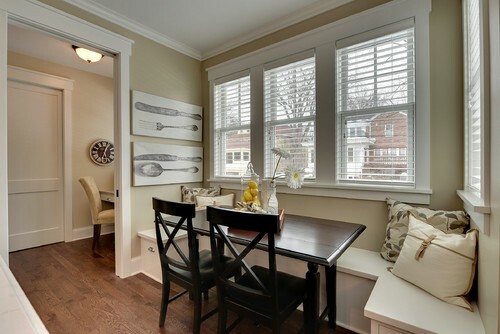 Your window molding would be the same while the crown molding would follow the cornice. Can’t wait to see all the progress you will make in the coming year! Otherwise, I think it would be perfectly fine to do a smaller scale version of your door casings. I would use similar proportions, just shrunk down a bit. That would look great too. Yes, my builder windows are sheet rocked with only a sill. Not a good look. I like the idea of trimming the wind the same as your doors but with “slimmer” dimensions. Could you trim them the same with a .5 or half scale? With your beautiful draperies as a focal point I don’t think it will really be an issue. 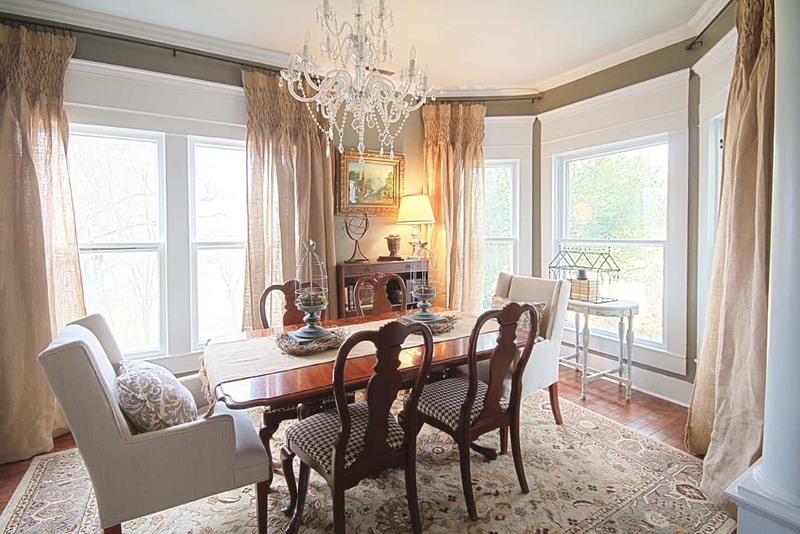 However, I think it would look perfectly fine if you had high window casings and then squeezed in the curtain rod in the few inches left between the crown molding, similar to this: http://www.thistlewoodfarms.com/wp-content/uploads/2012/04/72KariFeb12_011.jpg The extra window molding makes the windows look even bigger than they actually are. Hey that first one is from the Timeless House! That blog is a great resource for the correct proportion in moldings and it has lots of historic architecture case studies. In a well designed room that has focal points like your dining room, I actually like when the casings only complement each other and don’t match. The design is layered and more complex that way, without being visually overwhelming. I don’t think I’ve ever seen an example either, but I do think it could be done as long as you keep it a compatible style so that it doesn’t draw the eye (assuming you’re trying NOT to draw attention to it). 1) Use a simpler design that’s the same all the way around as the sides (say 1×3 all the way around). That should save you a couple of inches of height on the top. 2) Make the top flat board the same width as the side boards. This stays in the same style but saves you an inch or so in height without being so obvious, especially when it’s partially covered by curtains. Also, if you’re going to hang blinds or shades, you could face-mount them to the trim and it might further draw attention away from the shortened height. 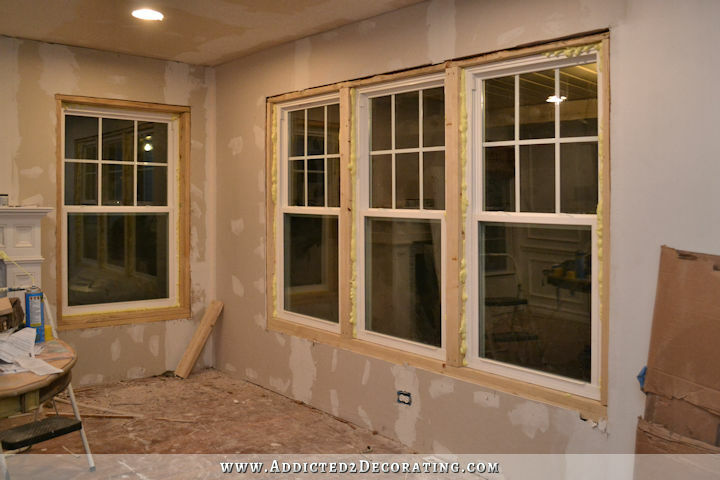 3) You could go completely trimless on the front windows, finishing the drywall right up to the window with corner bead or painted wood trim inside the window, but not around it. You see this technique typically in modern/contemporary homes and office buildings, but it could possibly work here if your objective is to de-emphasize trim on this one window. The effect should be similar to the photo above with the bump-out to the right of the cased doorway. 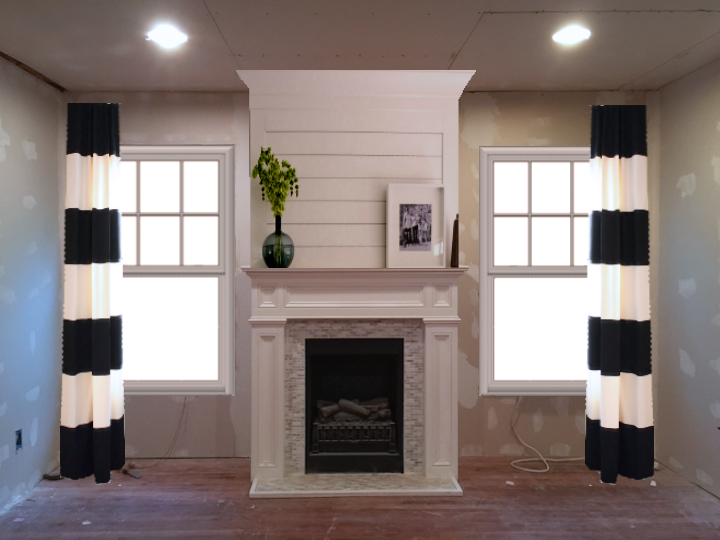 Whatever you choose, I think you should actually measure it out first or tack-up some blocks of the trim and crown molding above the windows using your regular design, then maybe even go so far as to hang a drapery bar with a bedsheet on it to see how it looks. No sense in figuring out a workaround if what you would normally do will actually work and it’s easiest to do all this before you finish the drywall, so you can repair the tack holes. I think the new taller mouldngs are designed to go with houses that have ceilings over 8 feet tall and beyond for proportion purposes. We have 8 foot ceilings and crown moundling all around the ceiling in every room and simple trim that is not tall to keep proportions normal for our 8 foot ceilings. I hand all my rod brackets at the base of the crown and they look nice. the rod shows the moulsding shows and the curtains and ceilings look tall. Just find the spot you like the best and go for it. When the composition is done it will look beautiful as do all of your installations! Also, this is somewhat related, but in my house I chose to have stained trim for my doors and windows in my formal room and painted in my laundry room, but for the room between the stained and painted rooms (my kitchen), I have stained window trim but painted door trim. I, personally, think that it looks beautiful. They do not have to match. You’re looking at new homes. Try looking at the older Craftsman houses. In the pics you post the ceiling is either taller than 8′, the crown molding is very narrow, or there is no crown molding. Would it look off to go with narrower crown in that room since you have the wider crown in the music room? 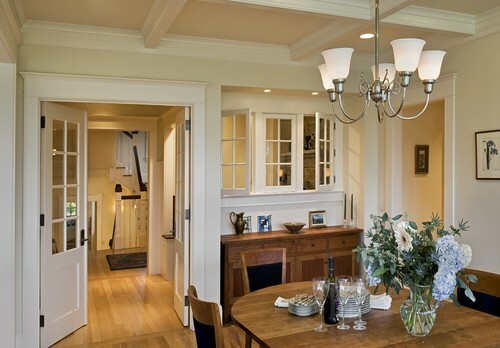 Have you thought of hanging the rods from the ceiling? Consistency for ‘like items’ with coordinating trim elements. Consider using your fireplace trims for inspiration then use new window casing trim combo throughout; on all your house windows. No pics, but in my dining room I had a similar dilemma and just had the window casing built with a smaller, but similar profile to allow for my curtain rod. Don’t think anyone has ever noticed, and in any case my drapes are the “star”. 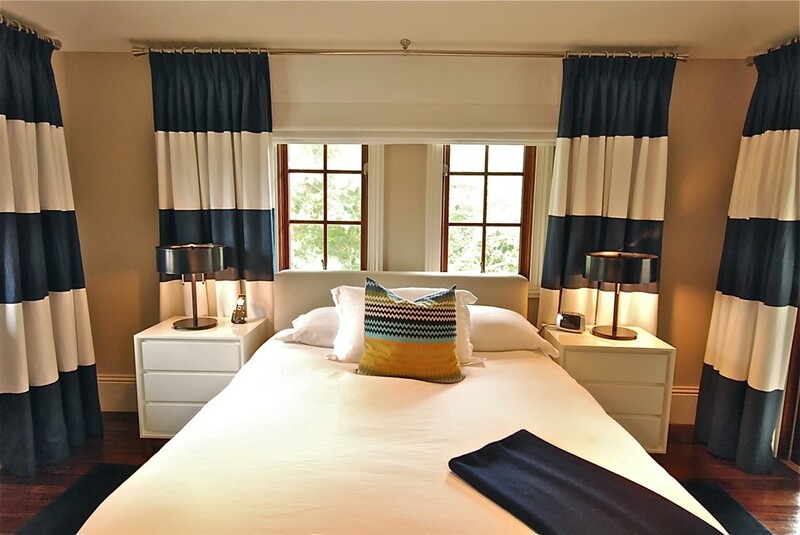 Certainly it doesn’t bug me, as the curtains steal the show and are full height, which I thought was more important. You could gain a few inches vertically by hanging your crown molding a few inches away from the wall and hanging your curtains behind them. I’m in favor of the same casings on your new windows but a little narrower. In her unfinished photo, I think it adds special emphasis to the window that it is different from the doors. 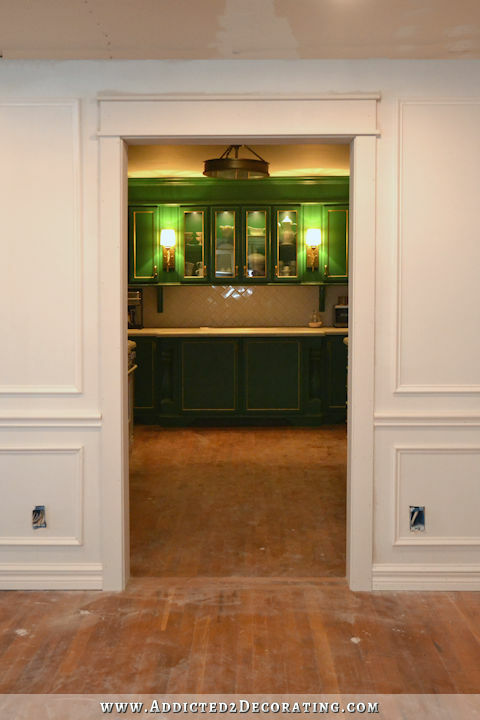 If you did your doors with grander molding, I think it would just add emphasis to the doors. As long as you keep it similar in style and coherent for each type then it will look great! My house was built i 1934 and the windows and doors do not match. The walls are plaster and curve into the door frame. There is no outside trim at all. The windows do have trim and a sill. I never thought about it. It doesn’t make an impression at all that they don’t match. I have a pic, but it’s not going to help you visualize. On my windows, the trim is covered by roman shades and drapes. I think it’s fine to not match. Maybe picture frame it without a sill. That might change the visual expectation that it look like a door. I like the idea of boxing out the crown molding and creating a cornice type of box to conceal the drapery hardware in this instance. Since you’ve aligned the top of the panel molding with the top of the door casing, it would bother me if it didn’t align with the top of the window casing. In terms of the details of window and door casing being different, it looks best if they match. Coordinating works if you have a space that needs a smaller casing because of ceiling height or something of that nature. Typically if there’s space separating them no one will notice. But since you’re design for these rooms that are all open to one another has strong horizontal datum lines, it’s going to be pretty obvious. 1-it’s not “track home” for the casing to match- it much more historically accurate. Often times the secondary spaces would have a simpler casing. In existing homes the reason the casing often times is different, is that when doing a renovation someone didn’t take the time and effort to actually match the original design. 2- builders leaving off the window casing isn’t a new “style” it’s called being cheap. Unless you’re talking about a very modern aesthetic to a home (which I don’t think the comment above was) In general I’d never base a design decision following what “spec builders” do- they are pretty much always looking for the cheapest solution. As a note- I’m an architect and do this for a living. This was my thought…build out the crown and put the drapery hardware behind. There were several good examples on Houzz. The casing you used in your mock up looks fine. Use that, install the crown molding then put the drapes right up under the crown molding. It will look fine. I am not nuts about what you plan above the fireplace. I think that is going a bit overboard. It is very heavy looking. I would put a great piece of artwork up there and be done with it. You can plank out the top of a fireplace in another spot in the house where you can balance the wall space with the fp. You need to let the eye relax in a room, not constantly be looking around at doorways and windows and FP etc. Too much is overkill. Save some of your goodies for the sunroom or the family/breakfast room if that is what it still is. BTW is there a living room anywhere???Blessings. I have casings on my windows and doors that do not match and it looks fine – great in fact and I just love it. We actually have fancier crown molding on the windows, but had to put simpler casings around the doors because they are spaced very close together and it would have been too much for the smaller areas in our very small home. As long as you are consistent it will look terrific. All of the windows each have the same more elaborate molding and all of the doors have the same simpler molding. They are all painted the same color and it all just works. They need to match. (or at least be as close to the doors size as possible.) In all of the pics that people have sent you, (imho), it looks kind of “wrong” when the door and window casings don’t match. My house was built in 1901 and the door and window casings match within each room. 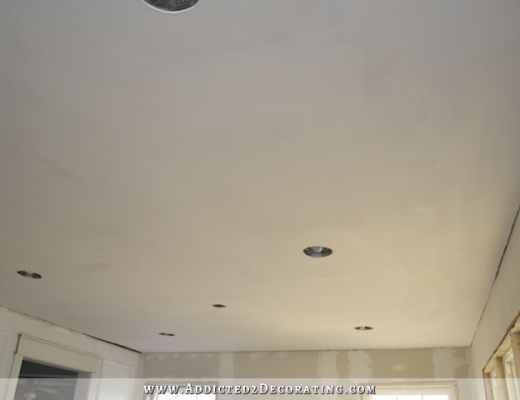 The two rooms that I believe were for the help have molding that is slightly simpler than the rest of the house. When we redid molding from a later addition which only had half round around the windows we did something similar but even simpler. 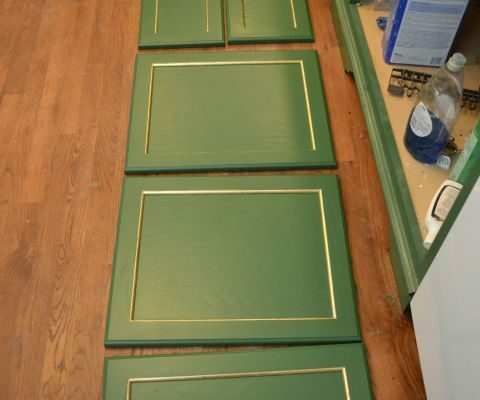 The fanciest molding is a 1 x 6 with three flutes and chamfered edges and that lays on a piece of rounded trim on each side to make it more substantial. The “help” rooms do not have the pieces behind the 1 x 6 and so it doesn’t look as bulky. 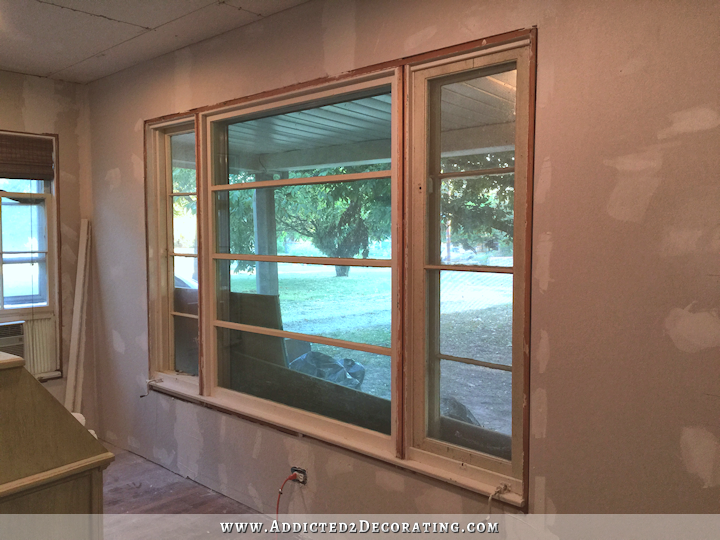 When we redid the trim in our sunroom we decided to do chamfered trim but without the flutes since there are fifteen windows and numerous doors. I have to see things to figure out our shop I would put the crown up first and then figure out what to do. I think they should match. I don’t think you will be happy if they don’t. Why not use the “swing bar” curtain rods. They hold a single panel and will give you the exact same effect. AND your molding will match. Doors are bigger, beefier, and more “important” than windows in that they take you from one space to another. Thus it does not seem illogical to me that the door casings could be bigger than the window casing. So long as the window trim is in the same style it will look fine. In my house they don’t match but they are similar. The door has extra pieces. The base trim is the same. I would be fine if they don’t match. I think you could do a smaller version of the door trim for the windows. You could also hang the curtains so they hide the window trim. That is what I have to do – not for looks, but for insulation. Have you considered using the same style but making the boards narrower? My home was built in 1900 and the door and window trims don’t match, but coordinate with each other. I think it adds a little extra interest. It’s a historical house in Hungary, Europe. For one I have never seen non-matching window and door casings. They seem to come in a package when you ask a contractor to do them. However, if these kinds of decorative uniqueness exist express curtains and blinds will definitely do the work. I really love decorating windows, whether they match with my doors or not and these blinds http://www.blindsonline.com.au/express-roller-blinds really does the work for me. But in the end, it all depends on the people living inside a home on how they would decorate and make their homes personalized for their family. Where I live (granted, half a world away on a different continent) houses are mostly built with brick walls and windows typically have sills but no other frame around them whereas the doors usually have frames. It looks ok to me, but I suppose that is a function of what I am used to seeing. I have to agree with other commenters that a similar but perhaps smaller frame is the way to go. If you made the whole thing smaller but with the same proportions it would proabably not be noticeable. Just out of curiosity (and I’m quite serious), is it called a door if there’s not an actual door in the opening? Also, you seem to be able to do mock-ups of things you’re considering doing, why not try it here. And as a side note, I’d love to know how you do your mock-ups. I think they need to coordinate but not necessarily match. I recently saw this listing for a high-end home in my area. I think pictures 5,6, and 7 are good examples. The door casings are similar to your’s but the windows are different. 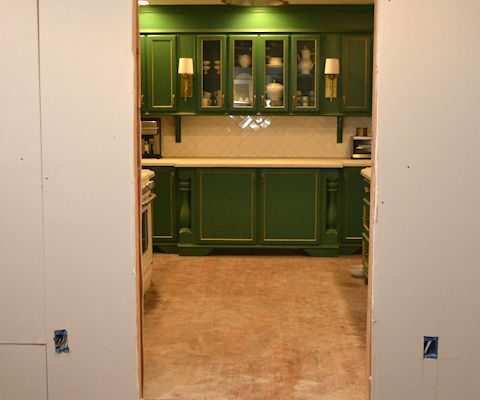 Btw, the view from the dining room into your new door opening in the kitchen is fantastic, great call on that one. The kitchen is just sooo classic looking, I’m sure you will never tire of it. It brings joy just looking at how beautiful it came out. I agree with Deb…Coordinate but don’t match could be a way to go. It’s fine to not match. I can totally relate to this. I didn’t read all the threads but we have a problem with wanting to match the door casing too! We have the windows installed already and the doors have already had the trim done. There is also an opening that’s been trimmed out with french doors. You can see them all from the kitchen so I think it would look funny not having the window trim match. Problem is we can find matching header that’s long enough and the contractor insists it won’t look good to splice it since it’s MDF. So now we can’t trim out the windows until we find a solution. What did you end up doing? Any pictures?